I left work early on Thursday about noon to get an early start on the Javalina HAM (Handgun, Archery, Muzzleloader) hunt that was to begin on Friday. I was really looking forward to this hunt for several reasons. One, I had purchased a new javalina call that I had heard worked exceptionally well and couldn’t wait to try out. Second, it had been since the October bear hunt that I had been out camping and hunting. That’s a pretty long spell for me. And third, I really enjoy javalina hunting with a pistol. Javalina don’t get up in the dark so we don’t have to get up at 0-dark-thirty, and the weather is generally good this time of year as well. Added to that, our Honeywell Sportsman’s Club had put on a Handgun Hunter’s Challenge shoot the previous weekend where I had done fairly well with my new .44 Magnum. I was ready. My son Jason, Steve and I had put in together. Steve and I would leave Thursday afternoon and Jason would join us later that evening as he had a soccer game to go to first. The predicted weather was for lots of rain. And when I say lots, it rained over 3½ inches over Thursday and Friday at our house in Phoenix. That’s more rain than we got all last year put together. So we started out, in the pouring rain on Thursday for unit 23, north of Roosevelt Lake. It’s about a 2½ hour drive to where Steve had left the tent trailer the weekend before. The rain had let up enough for us to raise the trailer and put up the canopy that would allow us some activity outside while it rained. Then the rain started up again and didn’t stop completely until noon the next day. Opening morning found us slipping and sliding along the muddy road in the rain and drizzle to a spot where we have seen pigs in the past and near where I had shot my last one. When the drizzle slowed to a tolerable level, we left the truck and hiked a short distance to the edge of a small canyon to begin glassing. We took up positions along some rock outcroppings on the west rim and began painstakingly picking apart the canyon with our binoculars from one end to the other. Jason was about 20 yards to my left and about an hour later began making hand gestures indicating he was hearing pigs directly below us. Sure enough, after I quietly snuck over to where he was standing, I could hear them as well. They were rattling rocks and occasionally grunting and snorting to each other. Jason now had the .357 out of the holster and was frantically stuffing the cylinder with shells. He had forgotten to load it when we got out of the truck. He had also grabbed a handful of JFPs instead of the hollow points that I had loaded for the hunt. 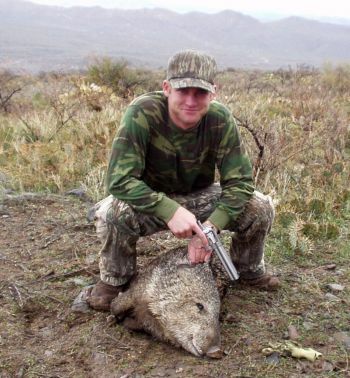 Now loaded and with pistol in hand, he began sneaking toward the nearest pigs who were about 70 or 80 yards away. I was now where I could see them but could only see three. As Jason closed the distance to about 40 yards he looked back. I am whispering, “SHOOT!” and making a gun with my hand, pointing at the pigs. Jason is whispering they're too far. I keep saying, “SHOOT, SHOOT!” So Jason takes aim and BOOM! The silence is shattered by the .357. The pig was hit but not mortally and they all began to scatter. I immediately started squealing on my new J3 javalina call and miraculously the pigs all begin to regroup, giving Jason another chance. The second and third shots are clear misses but the fourth is through the lungs. The pig ran a short distance and collapsed in the bottom of the canyon. The two of us started the fun chore of cleaning Porky. I can say right now that I’d rather clean ten elk than one pig. I don’t know of anything that smells worse and they always seem to crap themselves. This was a real mess. After about half-an-hour, the pig was gutted and we started the long climb out of the canyon back to the truck. Steve was still on the rim watching us from a safe distance from the smell and messy work. About half way out of the canyon the rain began again in earnest so we left Porky by the rear of the truck and after washing up a bit, got in the cab to wait for the rain to settle down. When the rain died, we left Steve to continue hunting up the canyon and I took Jason back to camp to help skin and begin the de-boning work. As we drove into camp an AZG&F officer drove up in his Dodge to check up on us. You guessed it -- that’s when I remembered that we had not put the tag on Porky. We had been in such a hurry to get out of the rain we had forgotten to tag him. Jason and I showed him our tags and then I told him about the pig in the truck. He said that since we had told him about the pig and obviously weren’t trying to tag more than one pig, he would not cite us. He was a nice guy and we had a great conversation before he left us to check out some other camps. He judged that the pig was 35 to 40 pounds and from checking it’s teeth that it was 3 ½ years old. It was about 11:00 and we were the only ones to have gotten a pig so far that day that he knew about. We had heard no other shots. I left Jason to finish the de-boning and drove up the hill to find Steve. We covered about four miles, walking completely around the top of this mesa and glassing several canyons without finding a single sign or pig and returned to camp after dark, very tired of walking. This was compounded by the fact that our boots were each carrying about five pounds of mud with each step. 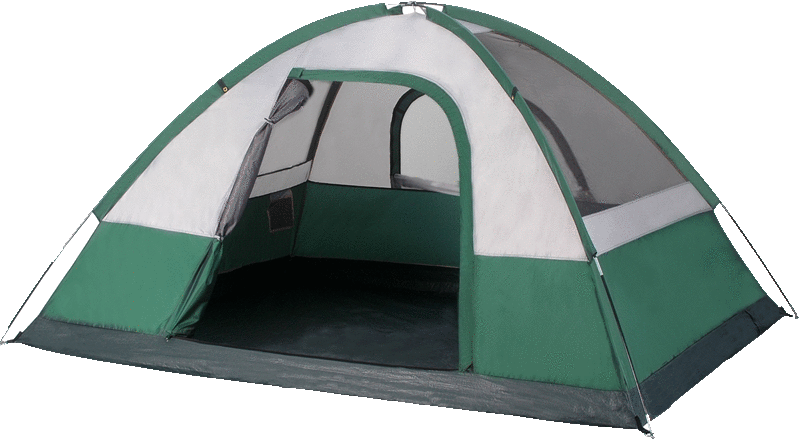 Steve’s tent trailer had developed an electrical problem where neither the lights or heater would work. Being the electrical engineer in the crowd, I was laying on the floor with my head under the galley, checking out some wiring with my digital volt meter when that new J3 javalina call slipped out of my shirt pocket. Hmm. The temptation was irresistible. Jason and Steve were not paying any attention so I quietly slipped it into my mouth and while watching them, let loose the loudest, most blood curdling scream I could muster. I couldn’t stop laughing for fifteen minutes. The startled expressions on their faces was priceless. They both left to change underwear shortly afterward. The rest of the trip was pretty uneventful. Jason left Saturday morning for Phoenix with 10 pounds of meat and Steve and I hunted all day Saturday, Sunday and Monday morning without seeing a single pig. We also didn’t see any rabbits, coyotes or any other wildlife except for ten mule deer and two whitetail while glassing. I’m also surprised that I wasn’t able to call in some predators with that J3 call. Evidently the drought has taken it’s toll on the wildlife in that area. On the good side, the weather was beautiful for the rest of the hunt and we got to see some great country, visit some Indian cliff dwellings and enjoy a nice campfire and great food each evening. It sure beats work.